"German dishes are great because they require very few ingredients. This easy way to make pork chops is flavorful and easy to do. By breading the pork chops before you bake them it really locks in all the flavor. When it's finished you won't even need a knife, the pork will just fall from the bone." Place bread crumbs into a shallow dish; pour eggs into a separate shallow dish. Heat vegetable shortening in a skillet over medium-high heat. Dip pork chops into egg, then into bread crumbs, coating both sides. Fry chops in the hot shortening until crumbs are golden brown, about 5 minutes per side. Transfer pork chops to a baking dish, leaving melted shortening in skillet. Cook and stir sauerkraut with juice, onion, and caraway seeds in the same skillet over medium-low heat until heated through, about 5 minutes. Spread sauerkraut over pork chops and pour pan liquid over the top. Cover baking dish tightly with aluminum foil. Bake in the preheated oven until chops are tender, 1 1/2 hour. 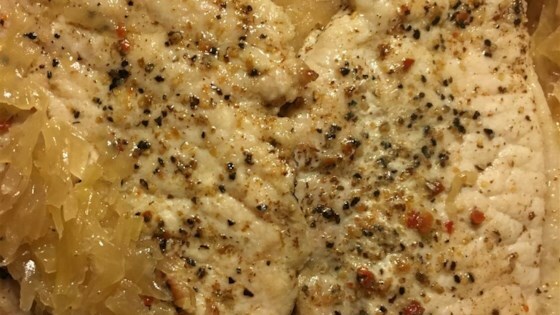 Baked pork chops in a zippy, accidentally delicious sauce. Good enough to make on a regular basis without getting tired of it. It's simple, straightforward, and classic. I made this for our good luck New Year's lunch with black-eyed peas and greens. This was authentic German pork chops. I didn't make any changes. It was very flavorful, like the title! Amazing! Pork chops tender & sauerkraut the best I’ve ever had!